Let’s face it: in many homes, the size of the laundry is on the small side. Beyond having sufficient room to wash loads of clothes, many customers would also love a little more room for cleaning-related storage. 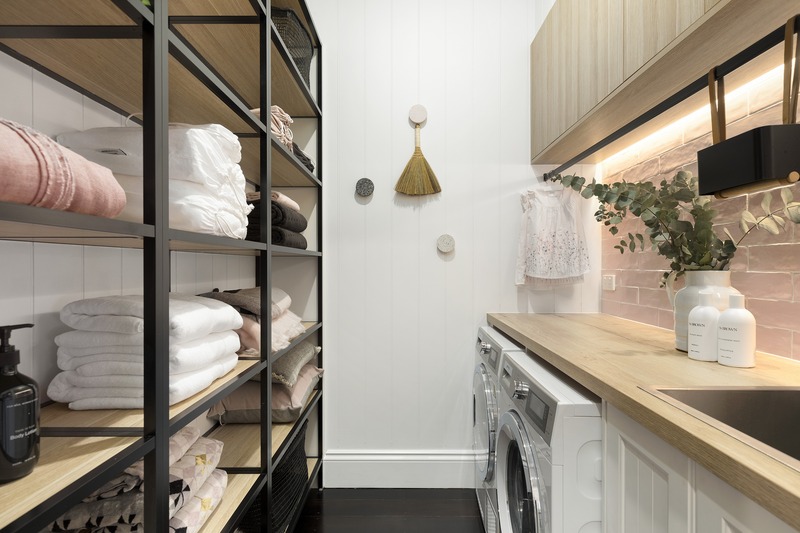 So, how do you maximize the space in a small laundry – both in functional terms for washing, drying and even ironing, as well as storage and style? Like many things in the world of interiors, the difference is in the design. A good designer can maximize the space you have, with the best layout and storage inclusions that you may not have thought about before. 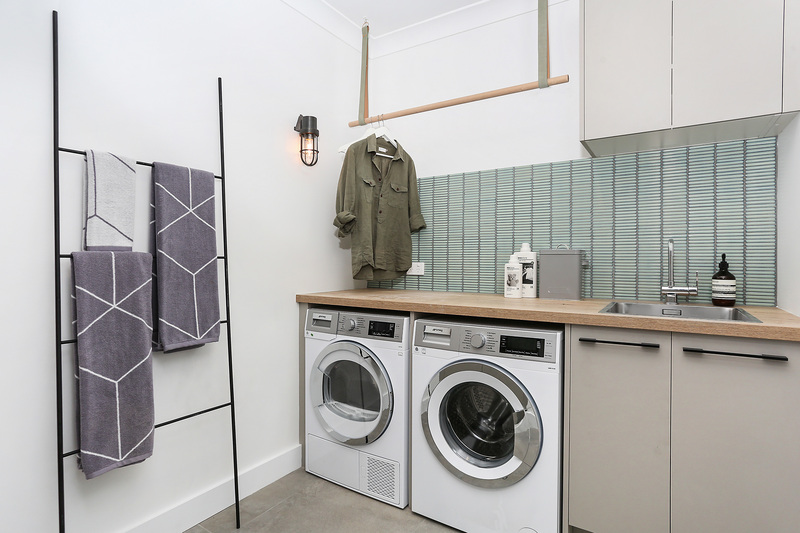 To give you an idea of how you can transform your laundry space, here’s a few tips from our Kinsman design experts on making the most of a small laundry. 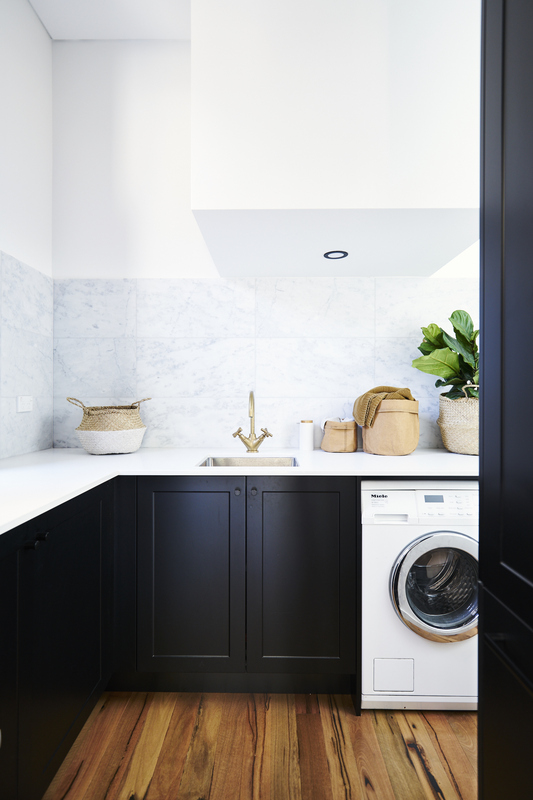 In a renovation, the position of your washer and dryer is often determined by the location of the existing plumbing, unless you plan on spending the time and money to move it. 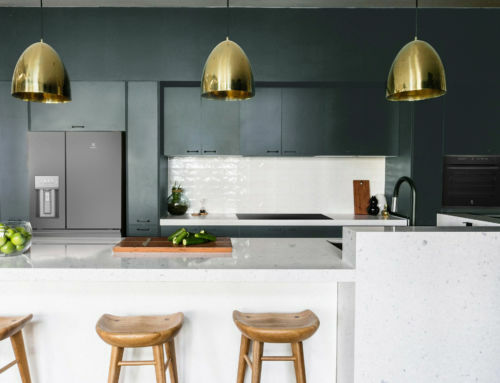 So it’s best to start with deciding on the placement of the appliances – and according to our designers, the best configuration is often to have them side by side rather than stacked. This means that you can then place a bench over the top of them, creating a work space with a decent length. 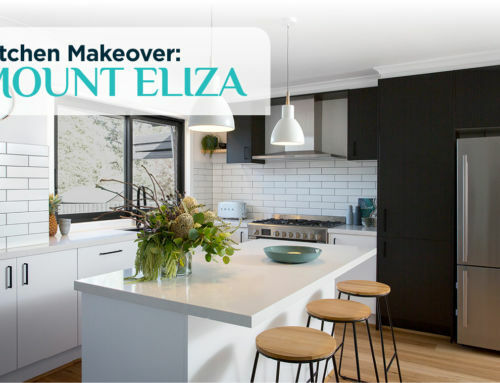 A benchtop in your laundry is invaluable as a folding station – so try to make it as large as the layout allows.  Ensure it has a decent depth as well as length, and is made of a highly moisture-resistant material such as the new hi-tech laminates available in the Kinsman range. These surfaces not only look great, they’ll last on and on throughout many years of laundering. Don’t leave the wall above your bench empty – this is prime storage space, whether you choose to go for closed cabinets or open shelving (or even a combination of the two). Do make sure the bottom part is in arm’s reach for your height, as you don’t want to have to bring out the step stool every time you use them. 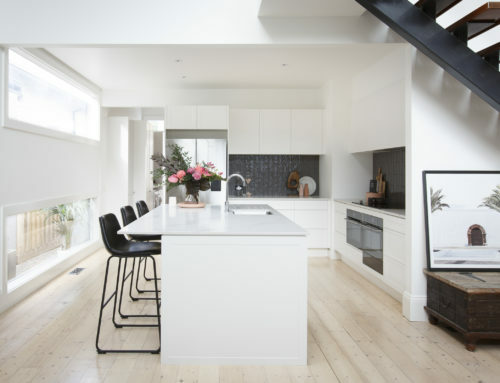 Open shelving can be made from either the same board as your cabinets, or contrasting materials with a timber look or matt black metal framing. 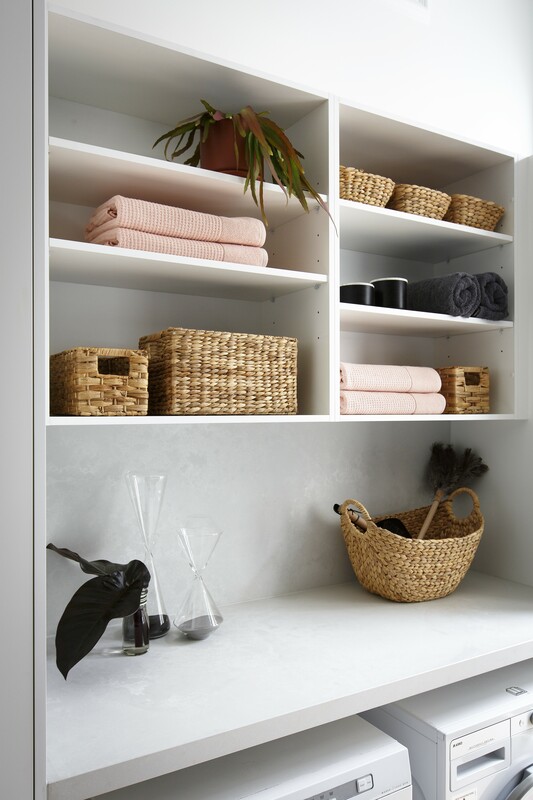 Shelves allow for airflow, so they work well in a laundry which can build up higher moisture levels – and they also encourage you to keep items tidy since they’re visible. If you have lots of smaller items to store, you always have the option of using baskets or boxes on your shelves to contain them. Shelves are also a nice way to bring décor into your laundry for extra style points. 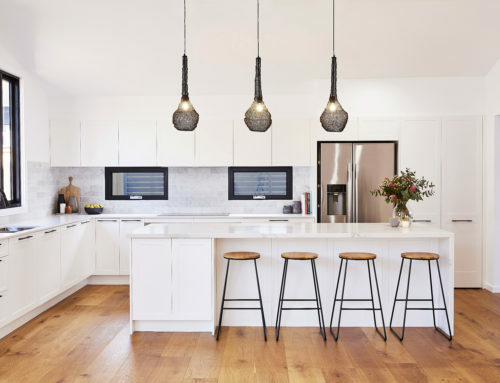 If you can, connect your laundry style to your kitchen so that there’s a sense of flow in your home. Be sure to cover ample amounts of standard cabinet sizes, but don’t forget at least one tall cabinet for your ironing board, broom and mop. If you can fit in a double tall cabinet, even better – the extra space can be used to hang clothes when ironing. It’s amazing how much you can store in baskets or storage boxes – they make great containers for smaller items. Be mindful to get enough to cover everything you need from the outset, so that you don’t end up with mismatched types down the track. If you’re really keen to show off your organisational prowess, you can use a label maker to neatly label each container for quick location of items. 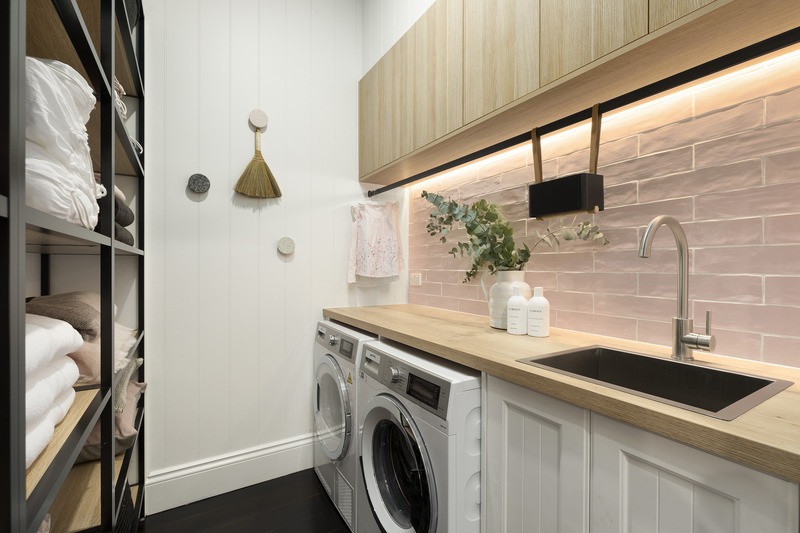 Whilst some small laundries just won’t have space for a sink, do check whether you can fit a small one in – you won’t regret the convenience of having a place to do hand-washing, and other messy jobs like washing your pet. To begin designing your own new stylish laundry that makes the most of your space, book a free design appointment at your home today.